For a WPF standalone application that is generated in Visual Studio 2010 using the New Project wizard, the entry point for the application is the Main function, defined in App.g.cs (generated code). In the default project, this is the public static void App.Main method. In general, a .NET application will use as its entry point (first function called) any method named Main that has public/static access modifiers–no matter what class Main is located in. If your application has more than one class with a public static Main method, you’ll need to specify the entry point in the project properties dialog. 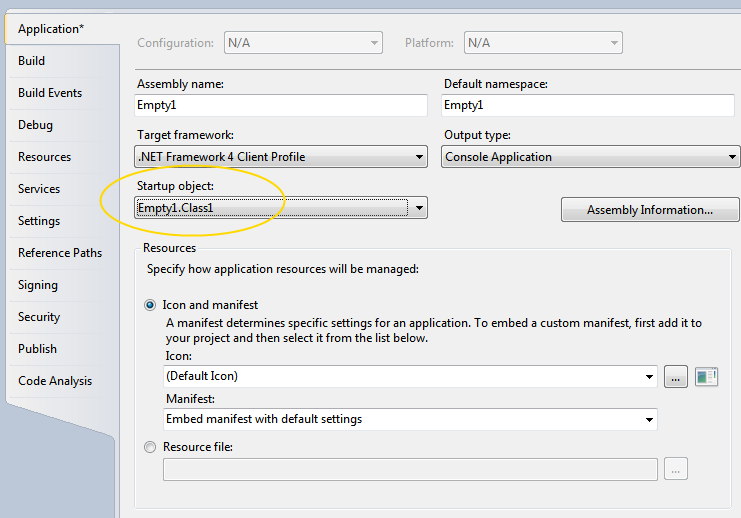 In the Startup object dropdown, select the class that contains the Main method that should be called on startup.